Clark County is located in the U.S. state of Nevada. As of the 2010 United States Census, the population was 1,951,269, with an estimated population of 2,204,079 in 2017. It is by far the most populous county in Nevada, accounting for nearly three-quarters of the state's residents – thus making Nevada one of the most centralized states in the nation. Motto: "Living Relentlessly, Developing Economically!" Las Vegas, the state's most populous city, has been the county seat since the county's establishment. 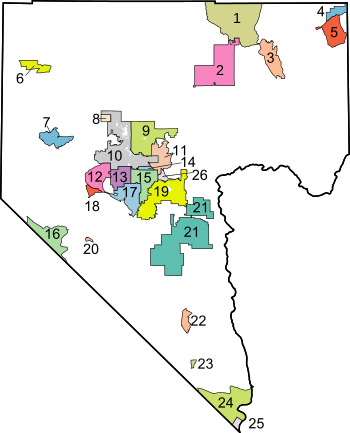 The county was formed by the Nevada Legislature by splitting off a portion of Lincoln County on February 5, 1909, and was organized on July 1, 1909. The Las Vegas Valley, a 600 sq mi (1,600 km2) basin, includes Las Vegas and other major cities and communities such as North Las Vegas, Henderson, and the unincorporated community of Paradise. Originally part of the Mexican Territory of Alta California, the Clark County lands were first traversed by American beaver trappers. Word of their journeys inspired the New Mexican merchant Antonio Armijo in 1829 to establish the first route for mule trains and herds of livestock from Nuevo Mexico to Alta California through the area, along the Virgin and Colorado Rivers. Called the Armijo Route of the Old Spanish Trail, the route was later modified into the Main Route by the passing merchants, trappers, drovers, Ute raiders and settlers over the years by moving to a more direct route. In Clark County it was northward away from the Colorado to a series of creeks, waterholes and springs like those at Las Vegas, to which John C. Frémont added Frémont's_Cutoff on his return from California to Utah in 1844. What is now Clark County was acquired by the United States during the Mexican American War, becoming part of the northwestern corner of New Mexico Territory. In 1847, Jefferson Hunt and other Mormon Battalion members returning to Salt Lake City from Los Angeles pioneered a wagon route through the County that became the Mormon Road. In 1849, this road became known as the "Southern Route", the winter route of the California Trail from Salt Lake City to Los Angeles during the California Gold Rush. By the mid 1850s the route now known as the Salt Lake Road in California and the California Road in Utah Territory, was a wagon trade route between the two. In the mid 1850s Mormons established a settlement at Las Vegas. In the 1860s Mormon colonies were established along the Virgin and Muddy Rivers. All of the county was part of Mohave County, Arizona Territory, when that Territory was formed in 1863, before Nevada became a state. In 1865, it became part of Pah-Ute County, Arizona Territory. The part of Pah-Ute County north and west of the Colorado River was assigned to the new State of Nevada in 1866, however Arizona territory fought the division until 1871. Pah-Ute County became part of Lincoln County and the westernmost part, the southernmost part of Nye County. Clark County was named for William Andrews Clark, a Montana copper magnate and U.S. Senator. Clark was largely responsible for construction of the Los Angeles and Salt Lake Railroad through the area, contributing to the region's early development. Clark County is a major tourist destination, with 150,000 hotel rooms. The Las Vegas Strip, home to most of the hotel-casinos known to many around the world, is not within the City of Las Vegas city limits, but in unincorporated Paradise. It is, however, in the Las Vegas Valley. Clark County is coextensive with the Las Vegas–Paradise, Nevada, metropolitan statistical area, a metropolitan statistical area designated by the Office of Management and Budget and used by the United States Census Bureau and other agencies for statistical purposes. The Colorado River forms the county's southeastern boundary, with Hoover Dam forming Lake Mead along much of its length. The lowest point in the state of Nevada is on the Colorado River just south of Laughlin in Clark County, where it flows out of Nevada into California and Arizona. Greater Las Vegas is a tectonic valley, surrounded by four mountain ranges, with nearby Mount Charleston being the highest elevation at 11,918 ft (3,633 m), located to the northwest. Other than the forests on Mount Charleston, the geography in Clark County is a desert. Creosote bushes are the main native vegetation, and the mountains are mostly rocky with little vegetation. The terrain slopes to the south and east. The county has an area of 8,061 square miles (20,880 km2), of which 7,891 square miles (20,440 km2) is land and 169 square miles (440 km2) (2.1%) is water. 2015 income distribution by household in Las Vegas. Population living below federal poverty line by census tracts covering Clark County. In 2000 there were 512,253 households out of which 31.70% had children under the age of 18 living with them, 48.70% were married couples living together, 11.80% had a female householder with no husband present, and 33.70% were non-families. 24.50% of all households were made up of individuals and 6.70% had someone living alone who was above age 64. The average household size was 2.65 and the average family size was 3.17. The county population contained 25.60% under the age of 18, 9.20% from 18 to 24, 32.20% from 25 to 44, 22.30% from 45 to 64, and 10.70% who were over age 64. The median age was 34 years. For every 100 females there were 103.50 males. For every 100 females age 18 and over, there were 102.80 males. The median income for a household in the county was $53,536, and the median income for a family was $59,485. Males had a median income of $35,243 versus $27,077 for females. The per capita income for the county was $21,785. About 7.90% of families and 10.80% of the population were below the poverty line, including 14.10% of those under age 18 and 7.30% of those over age 64. Large numbers of new residents in the state originate from California. As of the 2010 United States Census, there were 1,951,269 people, 715,365 households, and 467,916 families in the county. The population density was 247.3 inhabitants per square mile (95.5/km2). There were 840,343 housing units at an average density of 106.5 per square mile (41.1/km2). The racial makeup of the county was 60.9% white, 10.5% black or African American, 8.7% Asian, 0.7% Pacific islander, 0.7% American Indian, 13.5% from other races, and 5.1% from two or more races. Those of Hispanic or Latino origin made up 29.1% of the population. In terms of ancestry, 11.7% were German, 9.1% were Irish, 7.6% were English, 6.3% were Italian, and 2.7% were American. Of the 715,365 households, 34.9% had children under the age of 18 living with them, 45.0% were married couples living together, 13.5% had a female householder with no husband present, 34.6% were non-families, and 25.3% of all households were made up of individuals. The average household size was 2.70 and the average family size was 3.26. The median age was 35.5 years. The median income for a household in the county was $56,258 and the median income for a family was $63,888. Males had a median income of $43,693 versus $35,324 for females. The per capita income for the county was $27,422. About 8.7% of families and 11.7% of the population were below the poverty line, including 16.9% of those under age 18 and 7.6% of those age 65 or over. The Clark County Commission consists of seven members who are elected to serve staggered four-year terms in biannual partisan elections. The commission members elect a chairman, who chairs their meetings. A hired county manager handles day-to-day operations under direction of the commission. The county's unincorporated towns also have appointed boards that provide advice to the commission. The county operates out of the Clark County Government Center in the City of Las Vegas. The building is unusual in shape, and includes an outdoor amphitheater for concerts and other events. The Las Vegas Metropolitan Police Department provides most law enforcement services in the county, including operation of the county's central jail, the Clark County Detention Center (CCDC). The present department was created in 1973 when the Clark County Sheriff's Department merged with the Las Vegas Police Department. Other entities with police forces include University of Nevada, Las Vegas, the Clark County School District, and cities such as Henderson, Mesquite, Boulder City and North Las Vegas. The Clark County Park Police is responsible for all of the parks operated by the county and some selected special venues, such as the Clark County Amphitheater, Clark County Archery Range, and the Desert Rose Golf Course. The Regional Justice Center replaced the Clark County Courthouse in 2005, and is about 3 blocks from downtown Fremont Street, at 200 Lewis Avenue. With nearly three-quarters of Nevada's population, Clark County plays a significant role in determining statewide Nevada elections as well the winner of the state's electoral votes in presidential elections. At the presidential level, the county has had a strong Democratic lean to it throughout its history, similar to many urban counties nationwide. Republican presidential candidates have only won the county six times from 1912 to the present day, all coming in national landslides where the Republican won over 400 electoral votes The most recent of these wins was George H.W. Bush in 1988. At the statewide level however, the county is more of a swing county, with several Republican gubernatorial candidates & US Senators winning the county since then. The last Republican senator to win the county was John Ensign in his 2006 victory, even as Jim Gibbons lost it in his gubernatorial win over Dina Titus that year. Both Kenny Guinn & Brian Sandoval carried the county in both gubernatorial terms they won, however. The Clark County Regional Flood Control District (CCRFCD) was created in 1985 by the Nevada Legislature allowing Clark County to provide broad solutions to flooding problems. The Regional Transportation Commission of Southern Nevada operates the RTC Transit system, and does planning for most major roadways. The Southern Nevada Water Authority is a multi-agency group that manages the water distribution for the Las Vegas Valley. The Las Vegas Wash Coordination Committee manages and protects the Las Vegas Wash. Since 1999 the group has added more the 15,000 plants to stabilize the wash's banks and restore and expand the wetlands surrounding the wash. As part of the effort to restore the wash to a more natural state, they have removed more than 500,000 pounds (230,000 kg) of trash. The Grant Sawyer State Office Building, which houses many branches of state government, is within the City of Las Vegas. The Nevada Department of Corrections operates three prisons within Clark County. High Desert State Prison, a medium-maximum prison, and the Southern Desert Correctional Center, a medium security prison, are both near Indian Springs, Nevada. The Florence McClure Women's Correctional Center, originally called Southern Nevada Women's Correctional Facility, opened in North Las Vegas on September 1, 1997. It was built and operated by Corrections Corporation of America. On October 1, 2004, the Department of Corrections took direct control of the facility. It houses the female death row. The Clark County School District serves all of Clark County with 228 elementary schools, 59 middle schools, and 54 high schools being the fifth largest in the country. Student enrollment in 2014 was 324,093. Colleges serving the area are University of Nevada, Las Vegas (UNLV), College of Southern Nevada, and Nevada State College. Boulder Strip: This region includes 33 casinos on Boulder Highway. Casinos within the Henderson city limits are included as well, such as Green Valley Ranch, Sunset Station, Fiesta, Eldorado, and Jokers Wild. Downtown: There are 19 casinos in this reporting area. LV Strip: This region is composed of all the casinos on Las Vegas Boulevard, from The Stratosphere at the north end to Mandalay Bay on the south end. Also included are resorts near this area, such as The Rio, South Point, and the Hard Rock; and McCarran Airport. North Las Vegas: This region has 11 casinos and include the Fiesta Rancho, Texas Station, Jerry's Nugget, and the Santa Fe Station. Laughlin: The casinos in Laughlin. Mesquite: The casinos in Mesquite. Clark County has a diverse desert flora and fauna, including higher elevation mountain areas, the desert floor and the Colorado River/Lake Mead ecosystems. Variations in diurnal temperature as well as seasonal swings in temperature create demanding adaptation elements on the species of this county. Population expansion, especially since 1970, has placed additional pressure on species in the area. Correspondingly air quality levels prior to the 1960s were in a favorable range, but the proliferation of automobiles with the human population expansion created circumstances where some Federal Air Quality Standards began to be violated in the 1980s. To plan for the wave of development forecast by 1980, Clark County embarked on a regional Environmental Impact Assessment funded by a Federal Section 208 program, with Sedway Cooke conducting the planning work and Earth Metrics performing environmental analysis. This endeavor projected population growth, land use changes and environmental impacts. To prevent the loss of federal funds due to unacceptable dust levels in the Las Vegas valley, in 2003 the Nevada Air Quality Management division (under direction of Clark County officials) created the massive "Don't Be a Dusthole" campaign. The campaign successfully raised awareness of dust pollution in the Las Vegas valley, quantifiably reducing pollutants and preserving ongoing federal funding. The Apex Landfill, at 2,200 acres (890 ha) is the nation's largest landfill. Republic Services owns and operates the landfill. Nevada is the third most seismically active state in the U.S. (after Alaska and California); the United States Geological Survey has estimated that over the next 50 years, Clark County has a 10–20% chance of a M6.0 or greater earthquake occurring within 50 km (31 mi) of Las Vegas. The Las Vegas Convention and Visitors Authority posts the historical numbers of visitors and hotel rooms in Clark County. The era of massive modern casino resorts began with the opening of the Mirage in November 1989. ^ a b "American Factfinder". United States Census Bureau. Retrieved April 24, 2018. ^ Squires, C. P. Sam P. Davis (ed.). The History of Nevada. Nevada's Online State News Journal. p. 801. Archived from the original on July 20, 2009. Retrieved July 25, 2009. ^ "Metropolitan Statistical Areas and Components, December 2005, with codes". Archived from the original on February 9, 2006. Retrieved March 23, 2007. ^ "2010 Census Gazetteer Files". US Census Bureau. August 22, 2012. Retrieved December 20, 2014. ^ "US Decennial Census". US Census Bureau. Archived from the original on May 12, 2015. Retrieved December 20, 2014. ^ "Population of Counties by Decennial Census: 1900 to 1990". US Census Bureau. Retrieved December 20, 2014. ^ "Census 2000 PHC-T-4. Ranking Tables for Counties: 1990 and 2000" (PDF). US Census Bureau. Retrieved December 20, 2014. ^ "Household Income Distribution in Las Vegas". American Fact Finder. US Census Breau. Retrieved May 4, 2018. ^ "POVERTY STATUS IN THE PAST 12 MONTHS". American Fact Finder. US Census Breau. Retrieved April 9, 2018. ^ "Clark County, Nevada – Income in the Past 12 Months (In 2006 Inflation-Adjusted Dollars)". Factfinder.census.gov. Archived from the original on February 26, 2009. Retrieved May 4, 2013. ^ "About.com". Usgovinfo.about.com. June 19, 2010. Retrieved February 20, 2011. ^ a b c "Profile of General Population and Housing Characteristics: 2010 Demographic Profile Data". US Census Bureau. Retrieved January 21, 2016. ^ "Population, Housing Units, Area, and Density: 2010 – County". US Census Bureau. Retrieved January 21, 2016. ^ "Selected Social Characteristics in the US – 2006–2010 American Community Survey 5-Year Estimates". US Census Bureau. Retrieved January 21, 2016. ^ "Selected Economic Characteristics – 2006–2010 American Community Survey 5-Year Estimates". US Census Bureau. Retrieved January 21, 2016. ^ The leading "other" candidate, Progressive Theodore Roosevelt, received 261 votes, while Socialist candidate Eugene Debs received 108 votes. ^ "State Agencies and Departments". Nv.gov. Retrieved January 1, 2016. ^ "Facilities | Nevada Department of Corrections". Doc.nv.gov. Retrieved January 1, 2016. ^ "." Nevada Department of Corrections. Retrieved on January 6, 2010. ^ "Lone woman on Nevada's death row dies in prison." Associated Press at North County Times. January 31, 2005. Retrieved on September 5, 2010. ^ "Abbreviated Revenue Release Index". Nevada Gaming Control Board. Archived from the original on August 20, 2008. Retrieved May 3, 2009. ^ "February 2009 Nevada Gaming Revenues and Collections" (PDF). Nevada Gaming Control Board (Press release). April 7, 2009. Archived from the original (PDF) on February 17, 2012. Retrieved May 3, 2009. ^ "News – Dusty the Dusthole successful". Reviewjournal.com. Archived from the original on March 24, 2012. Retrieved May 4, 2013. ^ Schoenmann, Joe (December 17, 2008). "Official calls for sort reform". Las Vegas Sun. Retrieved December 20, 2008. ^ "Interactive Map Viewer." City of Las Vegas. Retrieved on June 5, 2009. ^ "Nevada Workforce Informer, Nevada`s Top Employers". Nevadaworkforce.com. Retrieved January 1, 2016. Wikimedia Commons has media related to Clark County, Nevada.